Excellent quality -- Online details could be clearer, packing better. Excellent frame. Was wrapped and packed in oversize box, and the frame was supposed to be held in place by glued-in Styrofoam pieces -- when broke loose and allowed the frame to rattle around packing box. Fortunately, no damage occurred. Also, online details do not really note that the the artwork must extend BEYOND the back of the frame -- as would most canvases -- for the included fasteners to work. For a poster, you need to add additional backing. 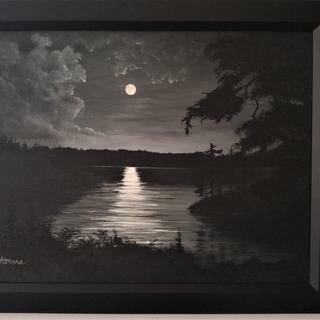 River Moon - Oil on Canvas 18x24"
Great place to buy custom sized frames. Nice well made frame. I am pleased with my purchase. As expected - correct dimensions, my art looks great! I ordered three identical frames for original watercolors. The frames are substantial, very well made, and precisely the size I ordered. I couldn't be happier! I have ordered this frame before and really liked it. Simple but substantial. I am ordering it again because it compliments what I am framing. I repeat purchased this frame because with the proper matting it really made the canvas image I had ordered stand out. It's a nice thick and sturdy frame and really highlights my artwork. They are very similar to the frames we currently have in our office.We needed custom sizes and these were priced right for us. We hope the quality is as good as we are hoping. I wished it to be at least 3" but 2" will have to do. I cannot find another with a similar beveled edge toward the oil which sets it off beautifully. I like the clean, yet bold style of the frame. Needed a simple black frame w/deep rabbet... Never been disappointed when ordering from this site. Works very well for graphite/charcoal portraits. I like the style and I have purchased the same style before. I like this frame for my photos. Rabbet depth enables me to back the prints with foam core as well as masonite. It was the perfect frame style for the picture at hand! Strong frame with a deep rabbet size. Simple angular forms and nice width to balance the size of the art. Also has a deeper rabbit to accommodate everything going inside. Classy looking frame to display my horror genre art prints collection. Does this come w 3/4” rabbit? BEST ANSWER: Hello Holly. The depth of the frame is 13/16" which is 3/4" in depth. Thank you for your inquiry! Have a canvass 18 X 24 I believe I need to have a way to attach canvas to frame. Do I need some type of nail / wedge to hold canvas in place? BEST ANSWER: Hello. You will not need nails to hold the canvas inside the frame. We send retainer clips with the frame to hold the canvas inside the frame. Thank you for your inquiry! I need a black wood frame 11.75x36 What size frame do I order? BEST ANSWER: Hello Freida! The frame size should be the same as the image size. Please order size 11.75"x36". Thanks! what is the exact width of this frame? I want a 2" frame wide. I have a picture thats 25"x35". I want to get it mat of 2" wide. What size frame would I need to get? BEST ANSWER: Hello Rohan! The width of the frame is exactly what you are looking for. The width is 2" and the depth is 3/4". The frame size you need to order is 25"x35". We add an 1/8" allowance the the width and the height. Please let us know if you have more questions! Happy Framing! Can you accommodate images smaller than 4x4? BEST ANSWER: At this time, we do not cut frames smaller than a 4"x4",however, you can order a Mat with an opening of 4"x4". Then you can add a frame with the mat.